Thanksgiving. It's a day that we set aside every day to remember to be thankful and count our blessings. Oh, and a day to eat ourselves silly. Our Thanksgiving started this year with Grace's preschool program at church on Wednesday morning. Last year's program was just darling with our adorable Grace dressed as an Indian. 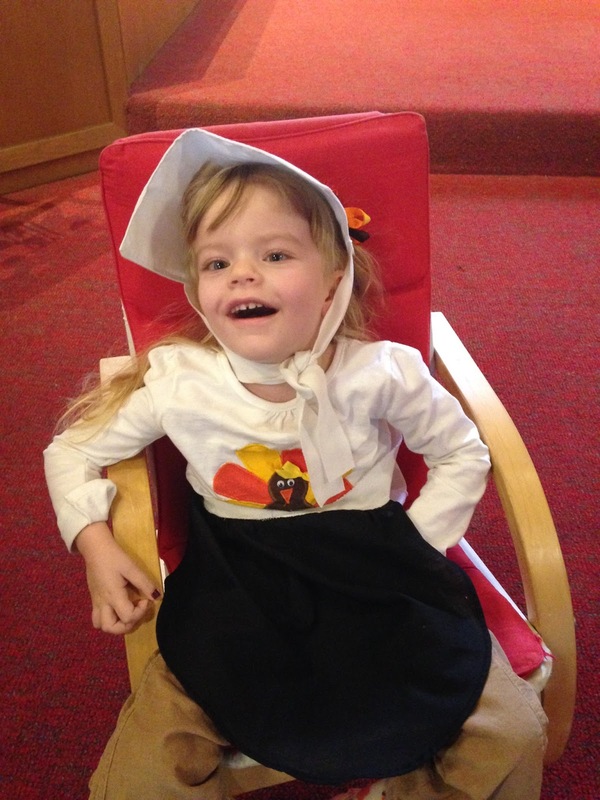 This year, she donned a pilgrim costume to sing some of her favorite songs with her friends. Our cute little Pilgrim at her preschool program. From "Little Cabin in the Woods" to "Indian Man" and "Bear Hunt," Grace seemed to enjoy the program and listening to her friends sing their songs. It's still hard for me sometimes to watch the programs and wonder what Grace's little voice would sound like singing with the kids. But when I turn my attention to Grace, her sweet smile is enough to let me know how much she enjoys participating in the program in her own way. And I wouldn't miss that for anything. Grace and her friends during their preschool program. After the program was over, we shared thankful stew with preschool families. Each of the kids brought something to add to the vegetable soup, and they had the chance to help prepare it. 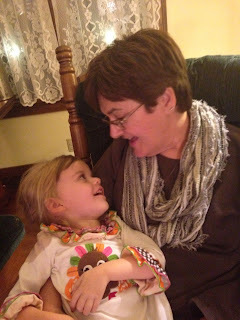 We enjoyed talking with Hazel and her mom, and sharing fellowship with Grace's friends. As we got ready to leave, a couple of the kids ran over to the door for the chance to give Grace a hug before we left the church. It warms my heart to see the way the kids love Grace just the way she is. Proud parents of the little Pilgrim! Later that night, my mom and dad invited us over for a pre-Thanksgiving dinner at their house. Dad smoked a turkey on the grill, and mom made some of our favorite dishes. Although we see each other at work all the time, it was nice just to relax and enjoy some time together. Oh, and the food was great too. Believe it or not, we actually woke up early on Thanksgiving morning. Well, some of us did. We had to wake Grace up at 10:15 to go to Kyle's mom and dad's house. But Kyle and I got up early for a special reason. We made five pounds of mashed potatoes to donate to our community Thanksgiving meal. Our church is responsible for bringing 50 pounds to the meal, so we were glad to help out. Grace and Quincy visited during Thanksgiving lunch. I was lucky that Kyle helped me peel the potatoes and it really didn't take very long. We peeled them the traditional way, even though we had seen a YouTube video on an easier way to peel them. We just weren't sure it would work. But together, in no time at all, we were all done. And they were delicious. I have to confess that Thanksgiving is the one time a year that I actually make mashed potatoes, and then we give them all away, but it's for a really great cause. Every year, we talk about making them more, but somehow we never seem to get it done. Aren't these little turkeys cute? Growing up, it was always my family's tradition to help at the community Thanksgiving meal, which is a place for anyone who needs a place to go who needs a meal. And although, we can't volunteer to help, it means a lot that we can still contribute. Cousins Kayley, Kensey and Katelyn also came over to play on Thanksgiving. After making our potatoes, I turned on another favorite tradition, the Macy's parade, while we got ready to go. We still had to wake Grace up to put on her turkey outfit, but we managed to make it to Kyle's mom and dad's only about 15 minutes late. We are fortunate that our families live so close to us, especially to celebrate the holidays. We enjoyed the annual Thanksgiving walk! Kyle's mom made lunch, which was great, and we got to hang out with his parents and siblings, and our nephew, Quincy. It was really fun to watch Grace and Quincy interact and talk to each other. None of us knew what they were saying, but they seemed to connect to one another. And then, I got some baby snuggles, when five-month-old Quincy fell asleep in my lap. This little turkey took a nap in my lap, and I loved the snuggles! About mid-afternoon, we packed up our stuff to head to my aunt's house. They had eaten at 2, but we dropped in to celebrate. We got there just in time for the annual Thanksgiving walk to the cemetery, where we stopped at my grandparents' headstone to remember them. And Grace loved the wind in her face throughout the walk. Enjoying some time with Grandma Susie. After we returned, I got my second set of baby snuggles for the day, when Grace fell asleep in my lap. She rarely does that anymore, so it was an extra special treat. We stayed long enough to enjoy dinner and watch some football together. Dad even had us watch a 50th anniversary concert featuring Arlo Guthrie and his favorite Thanksgiving tradition, "Alice's Restaurant." Our biggest reason to be thankful this year. That smile just says it all. Then it was time to head for home. Another year of celebrating family, friends and remembering all the blessings in our lives. And we wouldn't have it any other way.